The painter Nicholas Roerikh saw it as the heart of Siberia, Altai highlanders thought it was sacred, scientists deemed it to be inaccessible and athletes considered it the ultimate goal. Even today Mount Belukha, surrounded by the glaciers and turquoise lakes of the Altai range, attracts all kinds of people from throughout world because it is Siberia’s highest, most beautiful and most mysterious peak. Those that have managed to reach its ice-covered crest quickly get a sense of the enigmatic and mystical force of the Altai Mountains. Year round this grandiose mountain towers over the other peaks with its snow-covered caps, and that’s precisely why Russians call it “Belukha” from the word “bely” (white). Indeed, the Queen of the Altai, as it is sometimes called, is covered with snow year round. The climbing season usually begins in May and ends in September. In summer the temperature on the top of the mountains is about 6 C° on average. However, even in summer it can get as cold as −20 C°, whereas in winter it can drop to a frigid −45 C°. 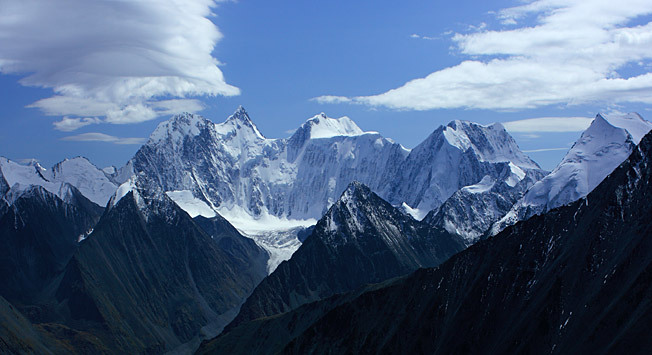 Mount Belukha gained popularity outside Siberia in the 1920s, thanks to the Central Asian expedition of the famous painter Nicholas Roerikh, who thought that the Altai and the Himalaya were “two poles, two magnets” connected to each other in some way. When he approached the southern face of the Belukha, the painter was amazed by the area’s purity and fascinated by how far the echoes seemed to travel. The best time to travel to Mount Belukha is between July and September. It is located in the Ust-Koksinsk district of the Altai Republic. Travelers usually arrive in Gorno-Altaysk, the capital of the region. You can fly there from Moscow and St. Petersburg (a direct flight takes about 4-5 hours). From Siberia’s capital Novosibirsk you can reach Gorno-Altaisk by bus (the journey takes about eight hours). If you book a tour to Mount Belukha with a travel agency, guides will often come and meet you in Gorno-Altaysk and bring you to the village of Tyungur, where there are some tourist centers you can stay for the night. If you’re not an experienced mountaineer, do not try to climb Mount Belukha on your own. It could lead to serious injury or even death. It is best to book a tour with a local agency that knows the area and has professional instructors. GotoAltay organizes regular climbing tours of Mount Belukha and often works with foreign tourists. All foreigners traveling to Belukha, whether independently or through a tour company, need to plan their trip at least one month in advance, so that they leave enough time to receive special border permits, as Belukha sits near Russia's border with Kazakhstan.